Many different factors come into action when a polishing lap is used to wear away glass. So much so that it is illusory to put this action into an equation. Yet, in order to understand better how optical surfaces are brought to the correct shape we can identify and study different phenomena that take place when "wearing away" glass. With a given lap, the pressure, the speed and the time spent are factors that influence the length of the polishing action, but they don't influence the shape obtained. One last factor to consider is the friction coefficient. Its value mainly depends on the nature and the quality of the material the lap is made of (pitch, Polyurethane, Teflon...). It also depends on the polishing liquid (more or less aggressive substance, proportion of water...). Translation movement : The element considered slides sideways following a trajectory that may be straight (linear) or circular (we then speak of circular translation), or even randomized. This type of movement brings about an action of "even wear" as every spot of the lap leads to the same amount of wear in a given time. 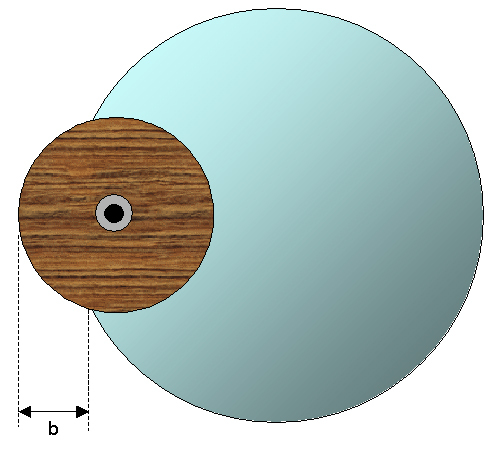 This situation is found when we place a lap on the glass disk of a mirror as it rests on the rotating plate of a machine. If the lap doesn't exceed the size of the mirror and if it is moved sideways by a pin which lets it free to rotate, it will follow the same rotating movement as the mirror (at the same speed). There won't be any differential rotation movement between the mirror and the lap. The main differential movement will come from the action of the pin, following a trajectory determined by the stroke chosen. That movement will be a translation movement. In that precise case we'll call the movement a circular translation and every spot of the lap will bring about a similar wear to the mirror. Circular translation : The lap spins at the same speed as the mirror. The only differential movement is a translation. Rotation movement : In such a case, the element is in rotation if we consider a direction of reference. We are then in a situation of "uneven wear". 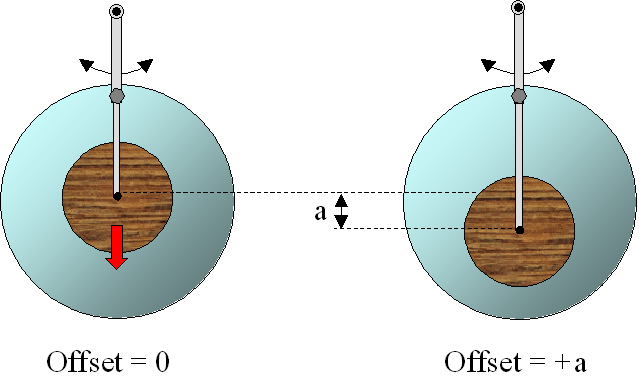 The wear action by a given spot of the lap is in proportion to its distance to the "instantaneous center of rotation" (see the definition given in C. Dévé's book). Thus, every spot of the lap doesn't bring about the same amount of wear at a given time. This is the situation we find when the lap is prevented from spinning freely around the pin. We get a differential rotation of the lap with reference to the mirror. The situation is the same when the lap, although left free to rotate by the pin, exceeds the side of the mirror. The surface of the lap in this overhanging situation doesn't have a balanced rubbing action of the two opposite halves (which was the case when the lap did not exceed the limits of the disk). Because of this the lap begins to have a slow rotating movement with reference to the mirror. 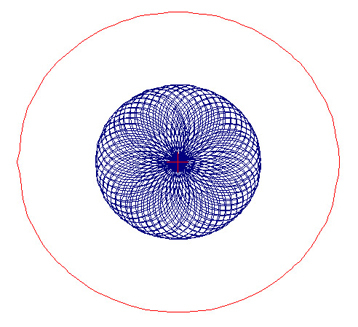 During polishing and figuring of telescope mirrors the translation movement is generally chosen, because of its overall effect, preferably to the rotation movement, with its non-linear wearing off effect, which is hard to control to obtain a regular shape, free of zonal defects. To that effect the polishing laps will be left free to rotate around the driving pin (thanks to a ball-and-socket joint, for instance). But, as it is impossible to avoid overhanging positions (which are necessary when polishing and figuring) there will be a differential rotation of the lap. Such consequences can largely be limited thanks to the choice of the rotating speed of the revolving plate. That speed will be considerably inferior to the back-and-forth movement created by the eccentric : this way the translation movement becomes more important than the rotation movement and the final effect can be compared to that of an "even wear" configuration. Just as it is for pressure and speed, it is obvious that the wear effect of any given zone of a mirror is all the more important as the polishing lap passes over it more often. When the polishing lap is moved sideways by a distance called d , we can compare the amount of wear brought about by two different zones of equal width of the lap (called l ). One is situated at the centre of the lap, the other one on the outskirts of it. It is evident that the length covered by the central zone (and therefore the surface covered) is more important than that covered by the outwards zone. 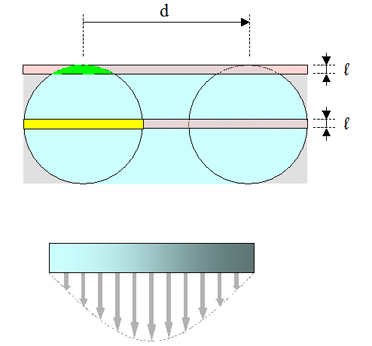 Thus, as the lap is moved over the surface of the mirror, the glass surface swept over by the central zone of the lap (painted yellow) will be more important than the surface swept over by the outside zone (in green). In consequence, the wear effect will be more important at the centre of the lap. 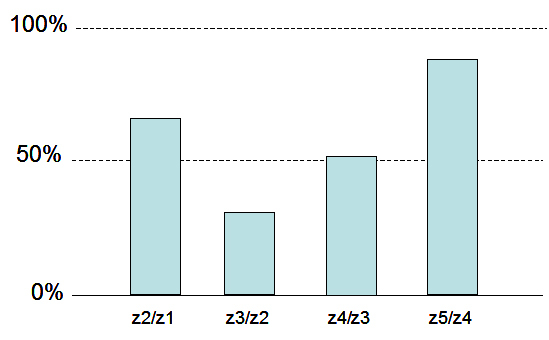 A model representation of the efficiency of the different zones of the lap, represented as a cross section, would result in a Gaussian graph. If we now consider the lap's movement over the mirror, it becomes evident that all the spots of it are not equally swept over. The polishing courses, whether by hand or by machine, are all, more or less, back and forth movements across the centre. Consequently the lap will sweep over the centre more often than over the outskirts. This phenomenon is magnified by the fact that the central zones are comparatively smaller in surface than the zones at the outskirts. To be more convincing, let us consider the global surface of a mirror as a juxtaposition of rings of equal width. For any given sweep of the lap, an outwards ring will be proportionately less affected than a central zone, and consequently less rapidly worn away. The blue curve represents the path followed by the centre of the lap during work. 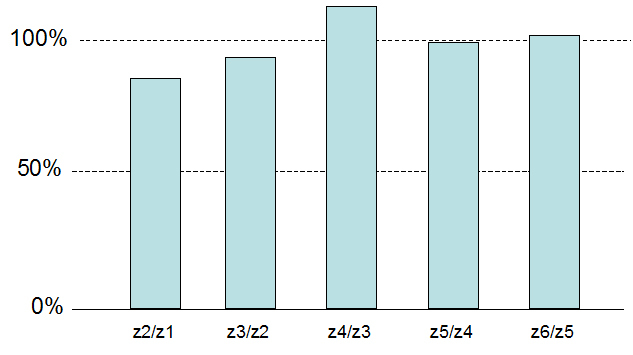 A graph showing how many times the centre of the lap sweeps over any spot of the mirror according to its distance to the centre. It is fundamental to start any work session with a careful pressing of the pitch lap, whether hand-polishing or machine-polishing. To that effect, one usually brings the lap to the proper temperature (in warm water or by using an heat lamp), then one must press it over the mirror with a layer of polishing paste in between, plus a good amount of weight on top. 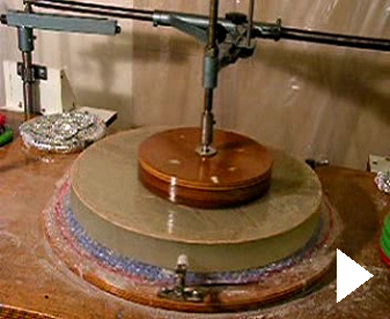 When starting a long polishing session it is not essential to press the lap with great accuracy as during work the pitch will naturally get warmer and the lap will soon adapt to the shape of the mirror and quickly eliminate the faults it might have created because of its irregular shape at the beginning. Yet, during the figuring sessions, it becomes impossible to compensate for a faulty pressing as the sessions become much shorter. One must be especially careful when pressing the lap otherwise it will be impossible to master the evolution of the shape. 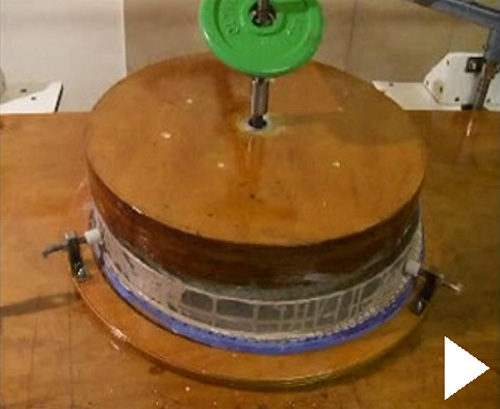 There exists a test to know whether a subdiameter lap is not well-pressed : if you place it over the mirror in an offset position (no overhang !) and you start the rotating plate (the eccentric being at rest) the polishing lap must rotate at the same speed as the mirror if the pressing of the lap is satisfactory. Otherwise you will get a difference of speed or an irregular movement of the lap. It is possible to make this phenomenon more evident if you place pen marks both on the mirror and the lap. When left unused for a long time, a lap will lose its shape : the pitch squares will melt down and become convex. This is even more important if the lap is stored in a warm room (mainly in summer). In that case it is advisable to keep it in a refrigerator (which also reduces the evaporation of solvents). It is necessary to press the lap for a long time if its squares have seriously lost their shape, but if you conduct frequent polishing sessions the shape of the lap will remain rather stable : it is then only necessary to cold-press it for a few minutes before each session. Now how about the grip ? 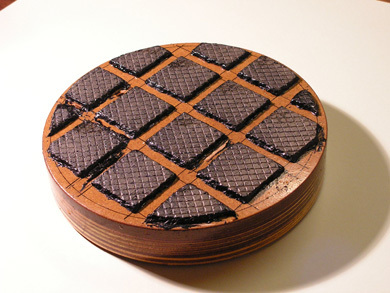 Glazed pitch squares are badly adapted to machine polishing. As a matter of fact, their contact is too "hard" and not homogeneous enough which leads to chaotic movements of the lap and to zonal faults through edge effect (see the video clip below). To improve the grip, one must "stamp" the surface of the squares, whether by using the tip of a cutter blade (regularly spaced grooves) or by pressing a mesh over the squares (a 5x5mm plastic mesh, for instance). To complete this action, Carl Zambutto finely scratches the surface of the squares using a brass brush (with thin stainless blades). It sometimes leads to a complete scrubbing of the crusted surface of the squares embedded by polishing agents. Pressing a mosquito net is another option. Those actions are often called " micro-faceting". Laps prepared with these techniques bring about a better flow of the polishing product as well as a more regular temperature of it. The lap/mirror contact gets smoother and more even, leading to a better action of the laps. One must find the correct balance between micro faceting and pressing the laps, through a trial and error process, until the laps are given a smooth and regular rotating movement. Yet, it is sometimes interesting to alternate work with the mirror on top and the mirror under a full-size lap : to accelerate the elimination of the grayness in the centre of the mirror, to smoothen out the shape or to bring correction to a zone (the centre for instance). Every 15 to 20 minutes, turn the mirror a little less than a quarter turn on the stand. wide strokes combined to a "large" lap will help correct the outside zones of the mirror : Indeed, the large lap will rub over a large centre in an homogenous way (almost a spherical shape) bringing less rub to the edge. As a consequence, the edge will receive an upward correction by comparison to the inside zones. a combination of short strokes and a "small" lap will bring correction to the centre of the mirror : The outside zones, remaining untouched by the lap, will not be rubbed down while the lap will frequently sweep over the centre, which will be "deepened". The centre will get correction, relatively to the outside zones . To make a long story short, it is always the centre that is the aim of the action but over a variable extent of surface, according to what surfaces are to be corrected (close to the centre or away from it), using tools of different sizes. 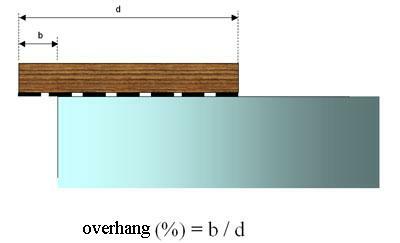 An overhang is the part of the lap that exceeds the edge of the mirror at the end of a stroke. It is usually given as a percentage of the lap's diameter (i.e. : a 50 mm overhang with a 200 mm lap makes a 25% overhang). The back and forth movement created by the rotation of the eccentric must be set so as to get even overhangs on either sides of the mirror. Increasing overhangs will bring more correction to the outside zones. Be careful not to use excessive overhangs as this will lead to turned-down edge. Setting an offset is a way to place the centre of the strokes away from the turntable's (and the mirror's) centre of rotation. Thus, the centre of the lap (which corresponds to the zone where rubbing is most efficient) will slide outwards and bring correction off centre. The offset effect helps bring correction from the central zones towards the edge. Frequent changes of the offset help getting a smooth shape as well as avoid zonal faults that are easily created by an excessive repetition of the same movement. Besides, using offsets is a way to increase the job done by a lap, as if its diameter were "inflated". This technique is a solution to avoid multiplying the number of laps one needs to correct each zone. One can easily see that using offset settings is fundamental when machine-figuring a mirror. The different parts composing the offset machinery will have to be precise and efficient. We insist on the importance of the principles applied when building a polishing machine. This will ensure efficient settings of the offset, leading to even overhangs (see the chapter dedicated to machine building). Some machines are built with two eccentrics. The main eccentric is used to give their length to the strokes. 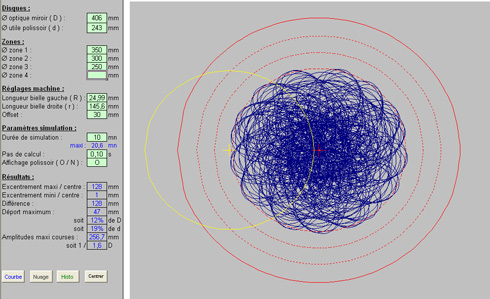 The second one is simply there to add some random effect to the main movement : this is called "randomisation". For this, its radius must be limited to a mere 1 or 2 cm, so as not to transform the overall shape of the strokes created by the first eccentric. Whenever one reduces the length of the strokes, the values of the second eccentric must be reduced as it mustn't become prevalent in the global movement. In some circumstances it is useful to bring its value to zero (eliminating its action completely), to ensure a fixed overhang and aim at precisely bringing correction to a given zone, or centre the strokes to rub down the centre more rapidly. The use of a second eccentric has a consequence on the overhangs, comparatively to a single eccentric : with a single eccentric overhangs will be equal at the ends of each stroke. With a double eccentric they will vary between a maximum value and a minimum value. This will have to be taken into account when selecting the overhang values for a double-eccentric machine in order to bring correction to the zones to work on : the maximum overhangs will only happen occasionally. The pressure exerted is a result of the combined masses of the arm(s), the lap, and the weight added to them, but it also depends on the surface of pitch squares in contact with the mirror's surface. It is therefore important to limit the amount of weight added to the arm when working with a small lap. It may even become useful to imagine a device which can reduce the pressure transmitted to the lap (especially when the arms are heavy because of the way they were built). Polishing phase : when using a pitch lap, one may work with pressures ranging from 50 gr. 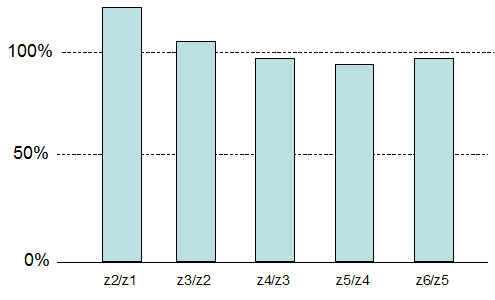 per cm² at the start down to 15 gr. per cm² towards the end in order to improve the aspect of the mirror's surface. With a polyurethane lap one may apply pressures as high as 200 gr. per cm². Figuring phase : To give the shape a quick start, one can start work with pressures around 20 gr. per cm², bringing them down to something like 10 gr. 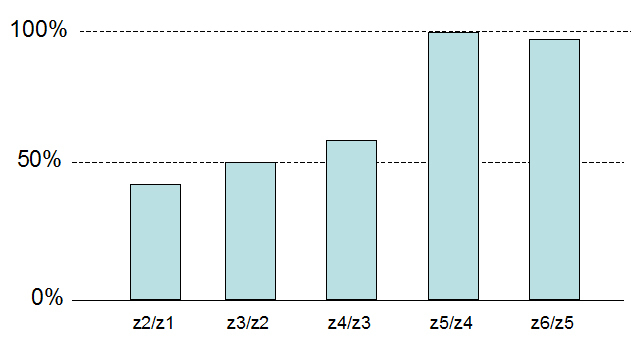 per cm² towards the end. 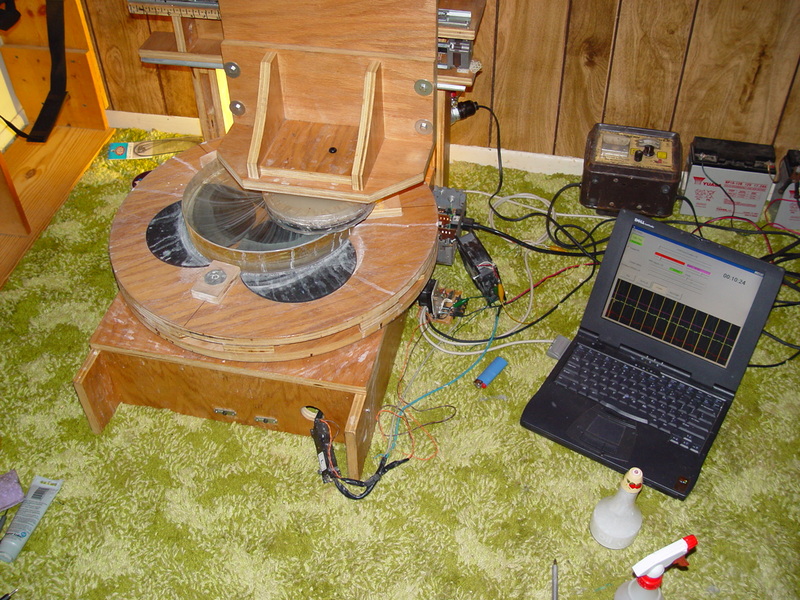 The disclosing of polishing machines and figuring techniques to amateurs is largely due to Carl Zambuto, a professional in optics for astronomy. Indeed, inside the forum he launched (zambutomirrorgroup), Carl Zambuto shares the knowledge he built through his own experience, giving generous advice. We don't intend in these lines to fully describe all his techniques. For this we strongly recommend all amateur opticians with an interest to join his forum in which they will find detailed answers to their numerous problems and questions. The master permitting, we will be content with recalling the fundamental principles he follows through his techniques. During this stage, Carl Zambuto uses an 80% tool that he places in a slightly tangential position (see the video clip). 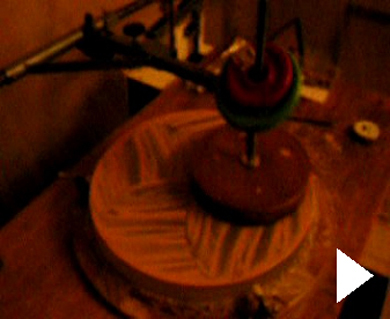 The rotating plate is given a fast spin (about 40 to 50 rpm). 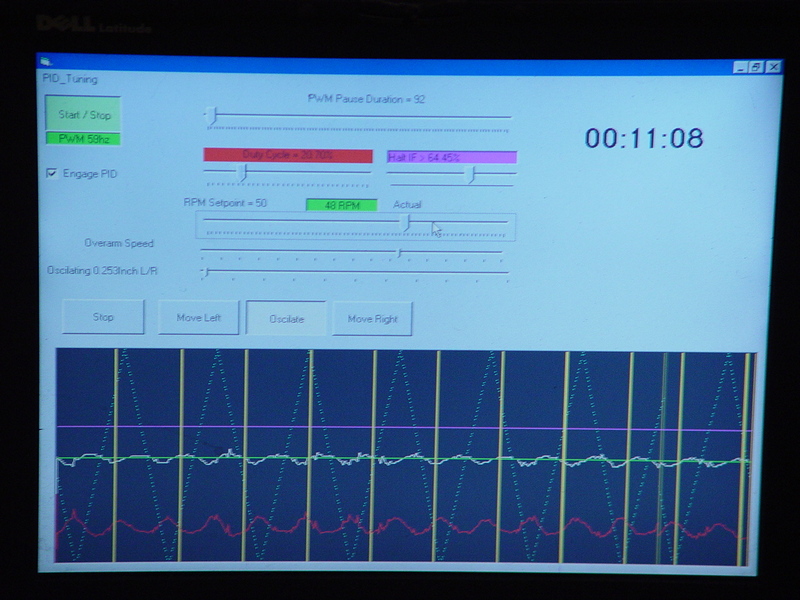 The amplitude of strokes is limited both in range and speed (the plate speed/lateral speed ratio is about 5). Thus the major part of the job is done by the rotating plate itself, which justifies the name "spin polishing" he gives to the technique. Carl Zambuto conducts the polishing phase in several phases (usually 3). Using high speeds to start with, associated to an aggressive polishing compound to eliminate grayness without worrying too much about the smoothness of the shape. He then goes on with a slower speed and a finer polish to get a regular sphere, reduce astigmatism and improve the smoothness. Carl Zambuto uses a generous collection of subdiameter laps (classically staged every inch -or half-inch- in diameter). He uses an Elgin/Waineo machine with only one crank, and he launches a series of polishing sessions with the same polishing lap but with different overhangs and different offsets. His strategy aims at bringing correction first to the outside zones and then to make it progress towards the center. He manages to keep the outside zones slightly ahead, making sure the inner zones aren't left behind too seriously. The crank's speed is more important than the plate's speed : Carl Zambuto uses crank speeds that range between 15 and 30 rpm, according to the diameter of the mirror and the progression of the job. The plate spins at a speed that is 5 times less. • 20% from the edge of the lap (when it reaches its farthest extension), one can notice the start of a curve, showing the zone where correction is brought. Carl Zambuto calls this particular zone of the tool the "sweet spot". • Outside this zone the effect of the lap is minor. Consequently correction is limited (it is absent once we reach the edge of the lap at its maximum extension). • Inside this zone the lap works quite smoothly and the shape obtained tends to be a sphere. Yet one must notice a correcting effect at the center as the lap frequently sweeps over the center of the mirror. 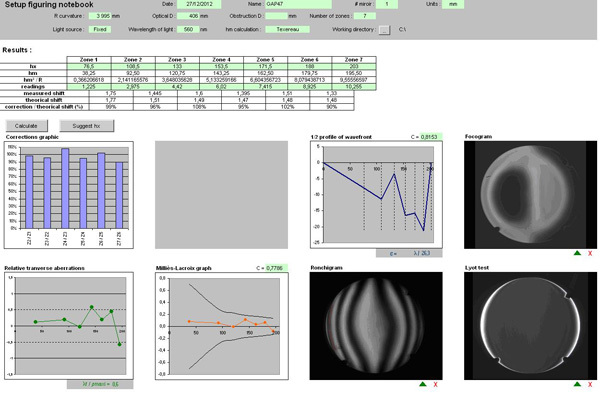 This effect will be controlled by offset changes in order to modify the strokes. This technique allows us to precisely aim at the zone to be corrected. 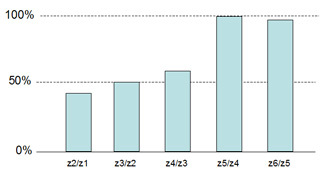 The graph below is an illustration of this. Let us imagine we wish to bring correction to the n zone (i.e. increase the longitudinal shift between the n+1 zone and the n zone). One must then bring the 80% diameter zone of the lap (its sweet spot) as far as the outside diameter of the n zone (when the lap is at its farthest extension). Thus this zone will take the major part of the correcting effect (the slope), the more central zone being more moderately modified (with the exception of the very center itself). Based on this property, a basic session will consist in successions of strokes whose lengths will be gradually reduced. This way, we will create a succession of corrections to the different zones of the mirror, starting from the edge towards the center. The mirror will start taking the shape of a parabola, introducing a longitudinal shifting between zones. This type of strokes with decreasing ranges is called "brush stroke" by Carl Zambuto. As a rule, all first sessions are conducted with a 60% lap with a 20 to 25% overhang, progressively reduced to 10%. Carl Zambuto has determined a 28% overhang as a maximum value. 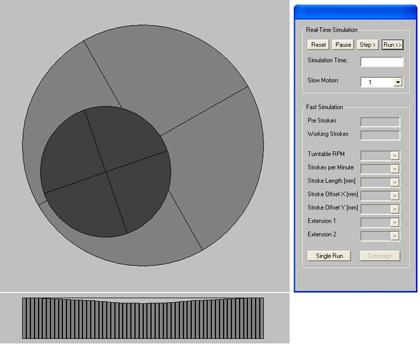 For each setting of stroke length (and its related overhang) various offset settings are to be selected in order to avoid zonal faults and so as to aim correction at the precise zone to modify. 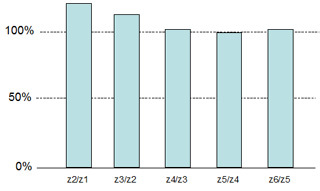 The time spent on each offset position is very short (from 1 to 5 minutes, mostly) and this requires frequent actions on the machine's devices. Considering its dimension, the large 60% lap cannot correct the central zones by itself. The following stages will therefore require smaller and smaller laps, using shorter and shorter overhangs (negative ones, even) but with the same technique (reducing the importance of overhang values and selecting various offset settings). This way, one follows a succession of sessions determined by the progress made (every session being followed by the taking of new measurements). Whenever correction must be brought towards the edge, a large lap will be selected, using ample strokes, whereas these factors will be reduced in order to correct the center. One quotation from the master perfectly illustrates the line to follow : "measure and adjust". The ideal process is of course to master a general balance of corrections all over the mirror surface, allowing for a slight advance to the edge. The diameter of the lap chosen for this must be as close as possible of 60% of the outside diameter of the zone to be corrected. 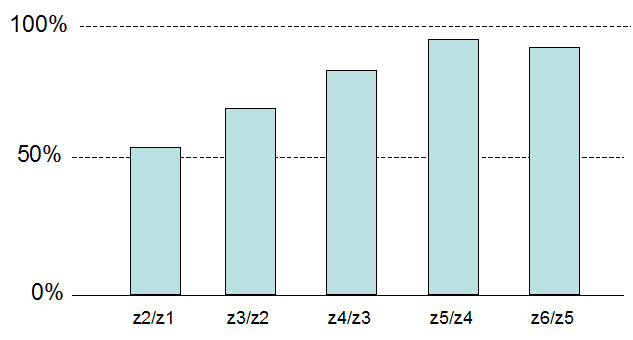 As for settings, offsets are increased while keeping overhangs at a stable value of 20% beyond the outer limit of the zone to be corrected. This type of offset progression makes the lap move outwards pushing the correcting effect with it towards the zone to be corrected, just as a sea-wave does. You can have a visual illustration of the phenomenon in the following chapter (see the clip). This is a very efficient technique every time you are confronted to a correction lag in a zone and you want to preserve the next outward zones. As a rule, it lets you bring important corrections to precise and limited zones. Carl Zambuto uses an adaptation of this technique whenever it is hard to bring correction to the edge. In such cases he uses a 50% lap and progressively increases the offset settings, keeping overhang at 15% all the while. Offset settings are brought to their maximum value, until the stroke's range becomes very short (because of the necessity of a constrained 15% overhang). It is a good idea to give more importance to the last offsets by spending more time on them, as this increases the correcting effect towards the edge. Last, one must speak of a special technique that Carl Zambuto calls "mop stroke". One makes then use of a large lap (a 60% polisher, mostly) applying to it a wide back-and-forth movement (with a 25% overhang). Offset settings are to be modified frequently (usually every minute or so) but within a limited range. Used over limited periods of time this type of stroke doesn't bring noticeable correction to any zone of the mirror (with the exception of the center, to a small extent). This may be explained by the fact that the efficient zone of the lap (80% of its radius) happens to be situated out of the mirror's edge at the end of the stroke. Besides, a large lap is known for creating quite a regular shape. These two qualities of the "mop stroke" are thus used to smooth down a general shape showing relative zones, without modifying the global profile. Consequently these strokes are well adapted to homogenize a surface before starting the figuring process, or after using a small lap whose "aggressiveness" usually brings a certain amount of zonal defects. This method is slightly different from Carl Zambuto's although it appeals to the same properties of the lap (adaptation of dimensions and overhangs to the zone to be corrected). Yet the logics used here work in a reversed manner : the progression is driven from the centre towards the edge. Thus the first step will consist in deepening the centre with the help of a small-diameter lap (30 to 40%). The pressures applied must be moderate so as to avoid too fast a correction and the creation of dog biscuit. Then, using a 50% lap together with wider strokes, the correction is extended outwards until the zone aimed at has been reached, not unlike a "wave" progressing towards the coast (see the clip below). This type of work is conducted by series of slight corrections until it has modified the zone that needed correction in the first place. 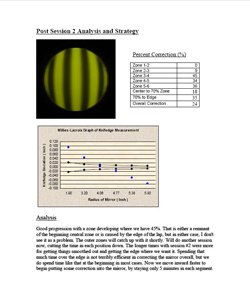 For the implementation of a progressive correction outwards one will make use of offset settings. 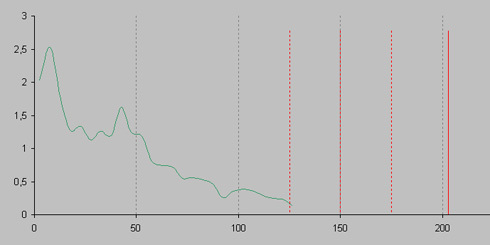 A 50% lap will bring steeper correction slopes than a 60% lap. This "aggressiveness" makes it more adapted for figuring fast mirrors. It is possible to use this method, as a complement to Carl Zambuto's, especially for fast mirrors (mirrors with a faint F/D ratio). Figuring should never be started before the general shape of the mirror has attained a reasonable homogenous aspect : limited zonal faults, no turned down edge (or, less frequently, turned up edge) and astigmatism, above all. A slight general correction is not a bad idea, far from it, if it is smooth and regular. 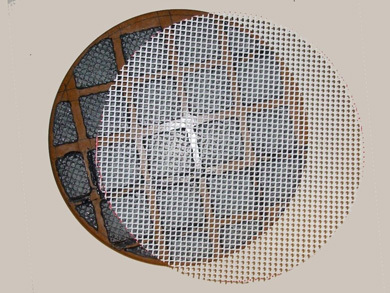 To get a good view of the situation, it is advisable to have a look at the general shape through a Foucault tester or through a Ronchi grating. If need be, one can even take some longitudinal measurements of the zone that seem most doubtful to you. In order to smoothe a slightly zoned shape before actually starting figuring, one can use a 60% lap with wide strokes (reaching 25% overhangs). 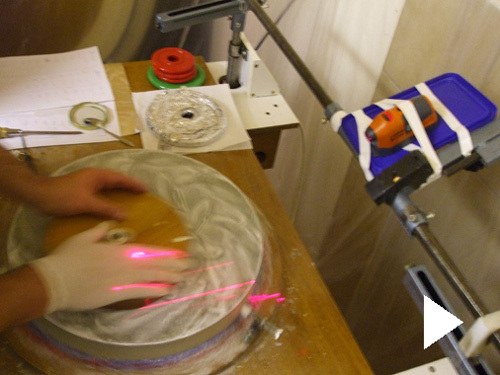 At the end of the first figuring sessions, the measurements made are rough, measuring the overall difference between centre and edge, for instance, using a Foucault tester. As for judging the smoothness of the shape and the absence of zonal faults, this can be done with a Ronchy test or Fresnel bands. As figuring advances it becomes more and more important to have a more rigorous method in taking measurements and deciding corrections. It will also be important to keep a corrections notebook made in order to follow their history and be able to understand their efficiency better. Here is an example of a corrections notebook kept at GAP47 (Excel file). Download the spreadsheet ( Excel versions 2000 to 2013 ) and the user guide. At the start, the progression for some of the bars will reach progressions of up to 10 or 20% between sessions, without any risk. Towards the end it will be wise to limit progressions to a few percents to ensure a "safe landing". At that stage it is advisable to work by series of short sessions instead of trying to reach the final result immediately, running the risk of over-reaching the aim of 100% on some zones. It is indeed often difficult to salvage a correction that has gone over the required value. This is especially true for the outside zone that is impossible to save through classical corrections. It is prudent to keep a little margin on that zone and wait for the final stages to "push" it to the 100% value. In spite of all the precautions taken, some zones may get too far ahead the others or progress without a general continuity. It is then important to bring the corrections needed in order to give the histogram a smooth profile, devoid of overcorrected zones. The general method for these corrections of the profile will be to aim at precise zones to increase correction there, or, on the opposite, to reduce it. All the devices present on the machine will be put to use : lap sizes, overhangs, offsets, importance of the strokes, nature of the strokes (brush stroke, sweep technique). All corrections have reached their aim except between the two outside zones. The last difference has to be increased without noticeable progression of the rest. Use the large 60% lap with long strokes (MOP strokes) with a 25% overhang beyond the edge. Change offsets frequently. The usual impact of this type of action is a reduction of the corrections at the centre. A good tip is to slightly hollow out the centre beforehand, using a small lap (30%). The 60% lap will quickly smoothen off the correction introduced thus and will erase all possible dog-biscuit the small lap might have created. 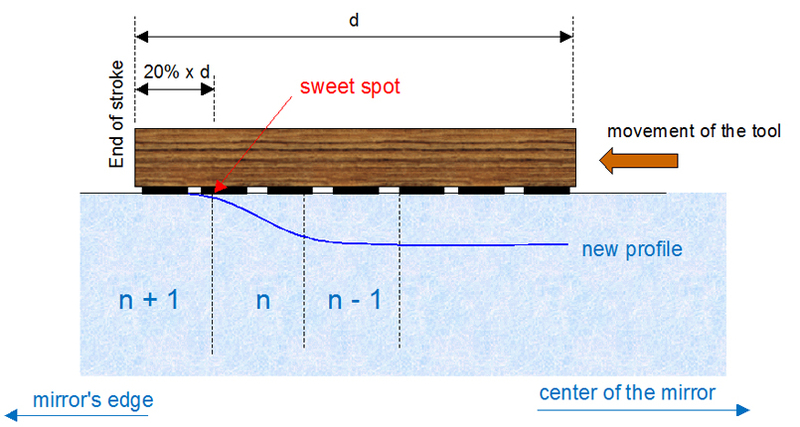 If correction is hard to get, one can opt for the sweep technique, using the 60% lap and overhangs limited to 20%, together with important offset settings . The outside two zones have reached their aim. Yet, the next central zone (z4/z3), as well as the zones towards the centre, are way behind in the correction process. It is essential to "bring up" those zones without modifying the two outside zones. The centre zones have been over-corrected and the rest have almost reached the 100% aim. One must then "bring down" those centre zones until they meet the others. The fact the last three graph bars show some under-correction is a safety mattress where the amount of central over-correction will be "pushed" to and "spread" over. Reducing these central zones will be quick as they are so reduced in extension : action times will have to be short, in consequence. This correction will be conducted with the large 60% diameter lap together with generous overhangs (about 30%). Offset settings will be frequently modified and pushed up to 10% of the mirror's diameter. The last two differences between zones have already been pushed to 100% whereas the result for the preceding zone is over that limit. 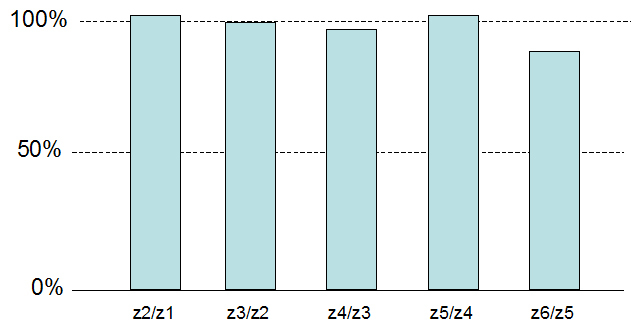 The reduction of the z4/z3 difference through classical techniques is bound to bring correction to the outside zones, resulting in over-correcting them. The only solution here is to go back to a spherical shape through a polishing session (the mirror being in lower position). 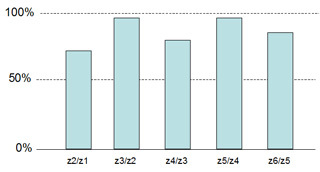 Yet, for high F/D ratios, that over-correction of the outside zones in the z4/z3 reduction process might be tolerable. In such a case, one may try a 60% lap correction session (with 25% overhangs) to smoothen out those over-correction values. 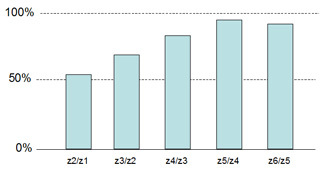 Offsets are quickly increased until they reach high settings in order to push corrections outwards. In case of failure, the back-to-sphere solution will finally remain at hand. The first two differences have been over-corrected and the next ones have already reached the 100% target. This looks a bit like the above situation but it sounds less serious. Indeed, the surface of the central zones is less important as that of the outside zones. As a consequence, that over-correction will easily blended into the whole outward surface, without bringing excessive change. 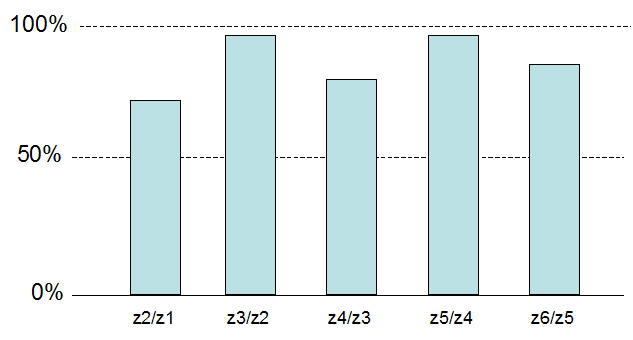 The same parameters will be used (lap size, overhangs) but using much shorter offsets and shorter working sessions. We may also point that, given identical values, central over-corrections have less consequence on the wave profile and transverse aberration than their outside equivalent. The graph follows a toothed profile which is the sign of the presence of a "corrugated" system of circular zonal faults. One must get rid of the causes which created those zones : faulty pressing of the lap, irregular movements of the lap due to insufficient contact, too little randomization of the strokes (because of insufficient changes of the offset settings and of the lengths of the strokes)... Afterwards, it is indispensable to smoothen out that cahotic surface with the help of a large lap (60%) associated to long strokes (25% overhangs). Make frequent changes of offsets to help avoid zonal faults. (*) For fast mirrors (with small F/D ratios), the large 60% lap will be dropped to be replaced by a 50% lap, which will be more aggressive. As for overhangs they will be allowed to exceed the 30% usual limit. In that precise instance the aim is to lower the crest formed by the slopes in zone 3 and zone 4. The tangential stroke moves the centre of the lap from the middle of zone 3 to the middle of zone 4. The lap's top efficiency is most important at its centre, consequently the number of times it sweeps over the crest will eventually level it down. 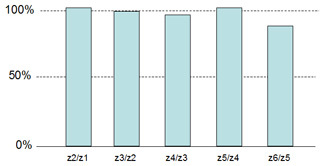 The surface of zone 3 being inferior to that of zone 4, it will tend to get more correction (the rubbing effect will tend to be more important there). To avoid that one will limit the importance of the movement over zone 3 (on the inward side of the crest) laying more stress on the outward side (zone 4). To that end offset settings will be used and this will improve the blending of the zones. Yet there is a dark side to that method and we must point at it. Reducing the slopes on either side of the crest means transferring correction to the zones on either side of it. If those zones are already well ahead towards the final target the correction brought to them may create over-correction. What lap diameter to choose is linked to how wide the crest is. A small lap will bring correction to a limited zone, it will work quicker and have a sharper action. Such an aggressive tool may create zonal faults and/or dog biscuit. Knowing that, it is advisable to launch a smoothing session immediately after, using a larger lap and the same type of strokes. the speed used must be moderate, keeping the same speed ratio between the turntable and the eccentric. the pressures must be limited, particularly so when using small laps, easing off part of the weight if necessary. finer polishing substance. The switch to it may be done when the corrections to the outside half is 75% completed. During the last sessions corrections will be applied through delicate precise actions and short times of action. The mesh print on the lap may create some slight echoing the structure of the mesh used at the time of pressing the lap. The elimination of that microroughness will have to be done during the final figuring phases. To that end one will press the pitch squares of the lap so as to completely erase the prints at their surface. Then a series of slow strokes will be performed, using a rather thick polishing liquid. Finally, the end of the figuring process will be followed by precise measurements. To reach that precision the measurements will be taken along two meridians at least, after letting the mirror rest a sufficient period of time (some hours will be a good amount). 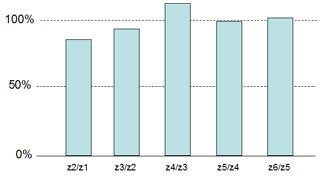 At that stage the mere graph showing the progression of the correction work won't be considered as sufficient. It will be wise to complete this analysis with a graph showing the wave profile, and another one showing the reduced transverse aberration. Up to now, all the projects of robotization of a polishing machine have remained extremely confidential among the ATM community. Yet, some experiments seem to be under way inside the ComputerizedMirrorMaking forum. Some type of automation may contribute to the randomization of strokes and help make the various setting changes smoother and more progressive. One can also imagine an automat will be able to "learn the job" to a certain extent by stocking the results obtained with such or such setting in a precise configuration of the machine. Yet one must remain reasonably enthusiastic : machine figuring a mirror in a fully automatic process, the operator just pressing a button to get the perfect mirror, is a complete dream. Whatever happens, an operator's experience and reactivity will remain essential to ensure a full success to the job. As a complement this software is especially useful to visualise any type of lap movement and make exchanges between ATMs easy when talking about their personal techniques. Under this tab one indicates the type of machine used, the speeds of the eccentrics and the speed of the turntable. 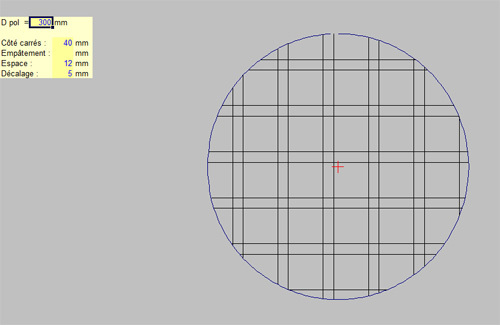 Under this tab one indicates the diameter of the mirror, of the lap and of the zone to bring correction to. The importance of the eccentricity and the value of the offset can be modified. Then one gets the importance of the overhang (in mm and as a %) and the line followed in a given time by the centre of the lap as it is moving. 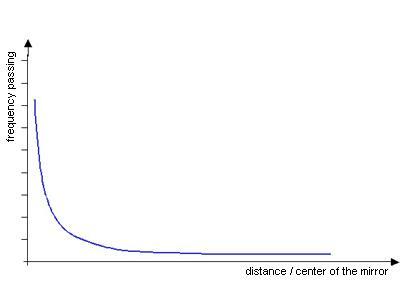 One can also visualize through a graph how many times the centre of the lap sweeps over every radius of the mirror. That way one can reveal possible "peaks" which might be created by the choice of a wrong speed or a bad setting of the eccentrics. Warning : These calculation sheets contain macros. To have them work properly they must be activated on opening the sheet, or select a low security level.